Distracted driving has become a serious issue in the U.S., especially with the rise of cell phones and other electronic devices. The New Hampshire texting ban marks the state joining several others in restricting or banning texting and other types of cell phone use while driving. Additional research on this growing problem of cell phone driving use has further clarified the risks distracted driving poses, according to a report by the Governors Highway Safety Association (GHSA). Of 100 drivers observed for a full year, one-fourth to one-half were distracted at any given time. Two-thirds of the 100 drivers observed used a cell phone while driving occasionally, and one-third used a cell phone while driving on a regular basis. One-eighth texted while driving. Daytime studies that observed passing drivers found that 7 to 10 percent of drivers are using cell phones at any given time. Fewer than 1 percent of drivers were observed to be texting at any given time. In 15 to 30 percent of crashes nationwide in 2011, at least one driver was known to be distracted when the crash occurred. 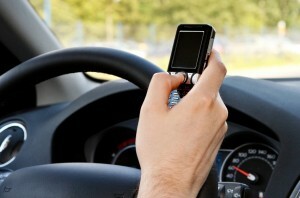 Cell phone use and texting both increase crash risk. There is no reason to believe that hands-free cell phone use is safer than handheld cell phone use. Distractions can cause serious accidents, especially when combined with other hazards like winter weather. If you’ve been injured by a distracted driver, the experienced New Hampshire distracted driving accident lawyers at Tenn And Tenn, P.A. can help. Call us today at (603) 624-3700 for a free telephone consultation, or call our toll-free Injury Helpline at 1(888) 511-1010.